We’ve arrived. It’s been about 15 years since we’ve been here in our own boat. About 10 years since visiting; and things have changed. In our mind; at this point, not for the better. But time will tell. Seems that progress has smacked the Bahamas on the head. This harbor use to be quiet even in summer. Now the hill sides are full of homes and the marinas have built out extra docks. Heracles I believe said that “There is nothing permanent in the world except change” and that is the case here. Posted in Places | Comments Off on We’re Here! We left in the am. Chicken me went up to Memory Rock adding about 12 nm to the trip. But I didn’t want to lay the boat over in shallow water in the Indian Cay cut. So we motored N and cut into the banks about 2 miles S of Memory rock seeing nothing less than 8′ of water. Funny; those that went through the cut say too is was 7+ feet all the way. Oh well! We then motor sailed to Great Sale Cay and anchored the night where w/ said the sky was magical. Almost nill light pollution! We could see some sky glow from Freeport Grand Bahamas but it didn’t really effect the stars above. Plus the air was dry as we’d been watching cold front after cold front pass so I’m sure we were able to imagine some extra stars out. Saturday we had quite a good sail to Green Turtle Cay – White Sound. Mostly it was down wind which can be a little bit of a pain with the rolling and the possibility of jibing but all in all we sailed 90% of the way. After upping anchor we rounded the S end of Great Sale and then hoisted them all. We furled the sails just outside of Green Turtle. I’ve posted the addy’s this way in hopes to keep the bots from harvesting our address’ and having to again deal w/ all the spam. We’ve left, we made it. We left Marathon on the weathermans prediction of SE winds. We made it under the powerlines into Boot Key Harbor with 1′ to spare. It was a spring high tide. A little gut wrenching, no! But now that we’re out of Florida we should be mostly bridge / powerline free. I swear that the powers that be (PTB) look for ways to make life miserable for those on the water. We stopped at the fuel dock and picked up 110 gallons of diesel fuel. That pretty well filled up our tanks. We’re listed as carrying 200. The dockmaster was a little surprised that a sailboat carried so much. We’re hoping to not need to buy any in the Bahamas as it’s roughly 1-2 bucks more per gallon here. Hopefully this will carry us through the winter and back to the states. We began sailing once we rounded the W end of Vaca Key but mostly were were close hauled. That kept us in Hawks channel and a little chop and a little wet but not bad. The wind just didn’t want to do what the wx man (or woman) suggested so for most of the afternoon we worked our way up Hawks channel and then finally after a couple of tacks exited the reefs at Alligator. And we sailed from there down the light of the Moon to West End Grand Bahamas. Ships kept W/ watches active and when I was up mostly I watched the Moon and clouds all the while ducking when Mother Nature would through spay my way. Finally, finally, we reached some of the Gulf Stream for the esclator ride N.
Minor things keep happening (as we expected), but they’re still a PITA. The blocks for the Wind Vane slowly moved and the control line was needing continual adjustments. Fortunately I didn’t need to fix the back during the trip. They’re on my “TaDo” list before we leave here. And to around 9 kts of boat speed the prop decided to spin. Well we had gotten so use to it not spinning I hadn’t locked it so now while it was spinning I jammed the lock in place and then it broke free and spun again and I needed to repeat a few times to get it to feather and stop spinning. And last while I had put cotter pins in all the critical rigging some I had left off for fine tuning and when we were close to West End discovered that the leeward lower shrouds were unturning. I didn’t figure that would happen because of the belaying pins but I guess I was wrong. So I need to tight up the belaying pins and put cotter pins in those turn buckles. For now, we’re here waiting for me to finish the projects and the weather to change. Till then …. Posted in Places | Comments Off on We’ve left, we made it. This Wind is our Navigator…. We had wanted to go to Miami and shoot off; we had a friend possible flying in we were going to pick up and I have a good friend I wanted to see. But Mother Nature has other ideas. It’s getting late in the season and we don’t want to get “stuck” in Florida. Also it’s a day up to Miami and then another day across so waiting again for a wx window wouldn’t be much fun in Miami ( I know it sounds weird to say that Miami wouldn’t be “much fun” ) but from a sailing diving perspective we don’t think it compares to the islands. Posted in Places | Comments Off on This Wind is our Navigator…. W/ rows. She even rows me around. Most will likely remember us here because she rows us in. Before anyone gets their hackles up there is a reason for it. Well, two reasons. 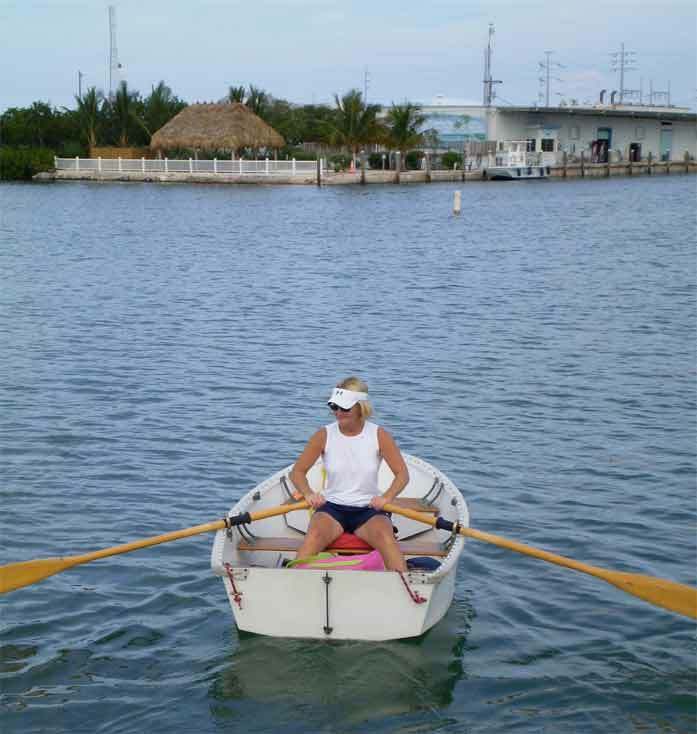 First; we haven’t made it to the Bahamas yet to get the engine for our other dinghy; Second, I just too darn big to be in the bow of the dinghy rowing and we would end up swamped. Neither she or I wish to turn our small car into a submarine. Here she’s going in to Yoga. Yeah it’s a tough life cruising. But hey! If we weren’t part of this community the harbor would be empty and it would all look like a desert. Now; we don’t want that do we.